Get ready for feminine fun with the Cabana Girl Dog Harness Vest with matching leash! 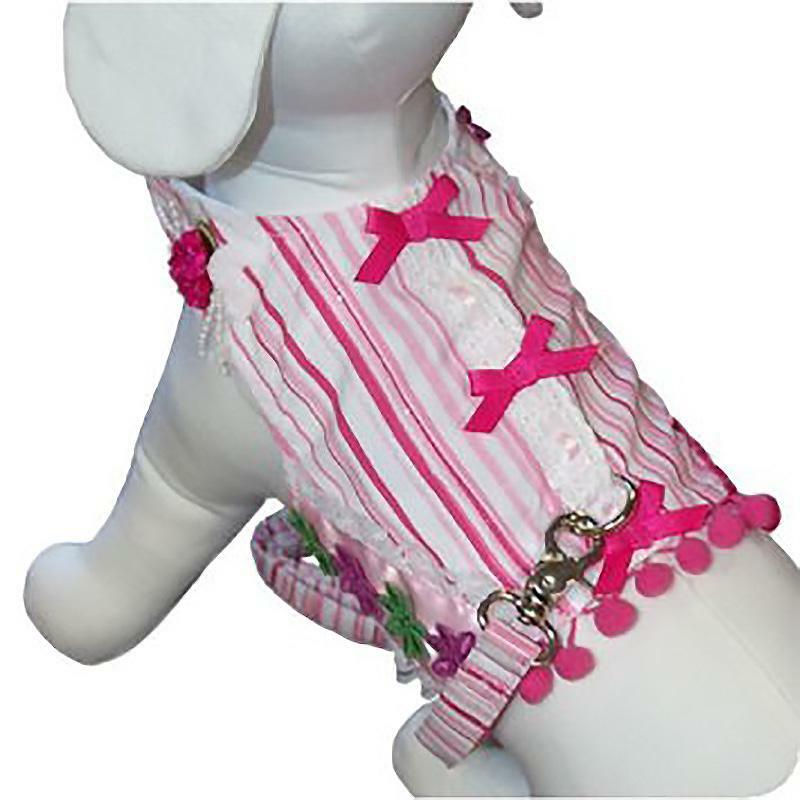 The Cabana Girl Dog Harness Vest with matching leash is a fun and feminine look for walking your pet. 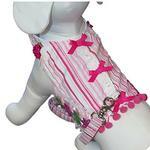 This pink and white stripe vest features lots of decorative details to get your dog noticed. Touch fastener at the neck and belly gives your pup a secure and custom fit. Get your princess pup noticed and stay safe during walks with this fashionable dog harness vest by Cha-Cha Couture. Posted On 11/17/18 by Biloxi from Biloxi, MS Yes, Biloxi recommends this product! As I always say with my Cha Cha Couture harness dresses. I love them. Posted On 03/21/18 by Jennifer L from Senoia, GA Yes, Jennifer L recommends this product! I love this harness so much. It is absolutely darling!!!! Liberty Bell is 13 pounds (French Bulldog) and the Large is a perfect fit. Posted On 02/19/18 by Lisa G from Lubbock, TX Yes, Lisa G recommends this product! Love the Cha Cha Couture harness vests - they are always unique and well made. They usually always come with a matching leash which is a nice bonus. They do run small - my 13 pound poodle mix wears a large in this brand and a medium in most others. The picture does not show that the vest and leash both have sparkly stripes running through them which adds a nice touch. Posted On 02/03/18 by Lauren H from Allentown, PA Yes, Lauren H recommends this product! I feel so lucky to have this cute harness vest for my spoiled pup. They only had large ? Large fits my dog great, love your sales. Posted On 02/02/18 by Lauren H from Allentown, PA Yes, Lauren H recommends this product! This harness vest is so stinkin cute, must have for summer.